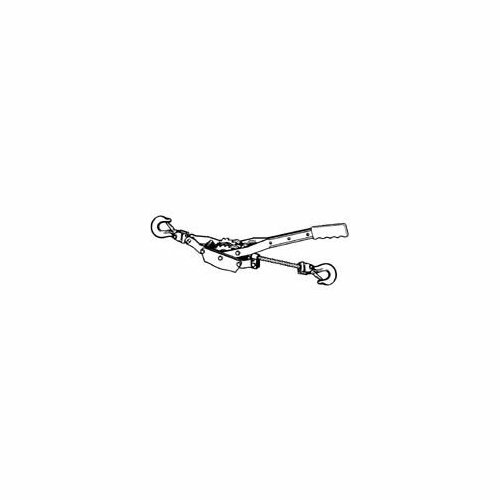 COME-A-LONG Imported - consumer grade 3/16" diameter galvanized aircraft cable Maximum lift 12 ft. 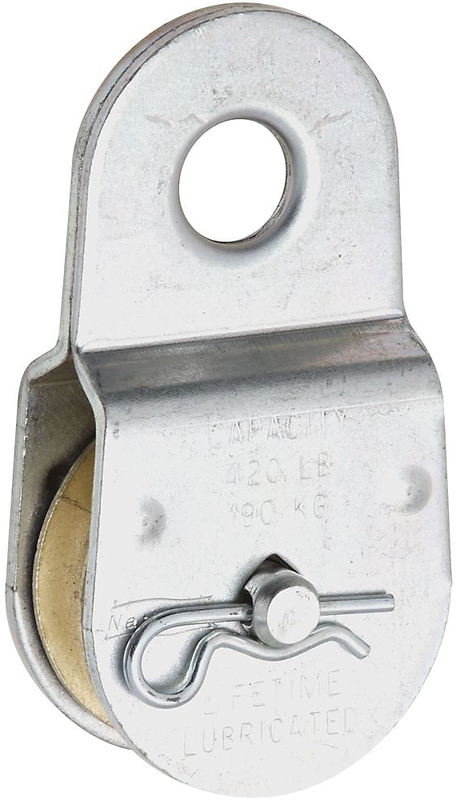 Double locking drive pawls Drop-forged steel frame, galvanized against rust Automatic let-down with safety latch CAL-1 1TON MAASDAM COME-A-LONG SIZE:1 Ton CABLE LIFT:12 Ft. 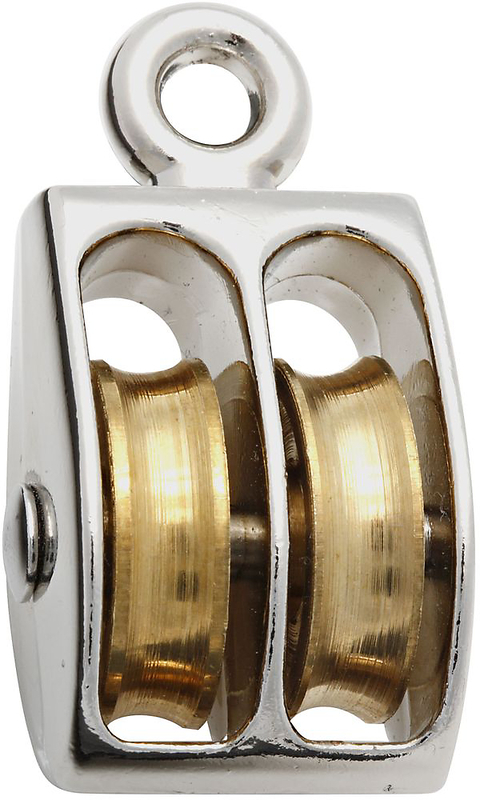 DOUBLE WHEEL SOLID EYE PULLEYS One piece cast construction rigid eye pulley Nickel plated with brass plated sheaves Size= wheel diameter x rope size Do not exceed working load limit Do not use for overhead lifting, to support- human weight, for playground or athletic- equipment or as a safety device Do not use if visibly worn or distorted T7655222N 1 1/2 IN. 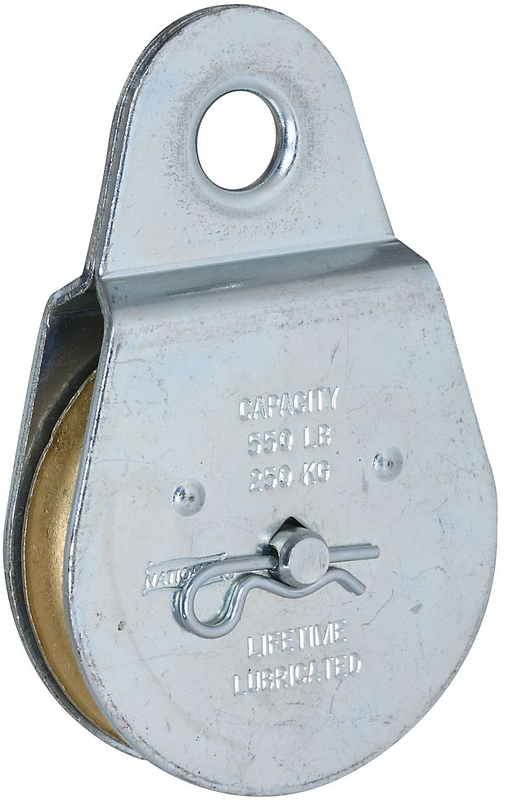 DOUBLE PULLEY SIZE:1-1/2"x 3/8" LOAD LIMIT:90 Lb. 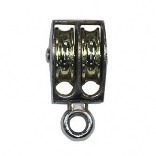 DOUBLE WHEEL SWIVEL EYE PULLEY One piece cast construction with swivel eye Nickel plated with brass plated sheaves Size= wheel diameter x rope size Do not exceed working load limit Do not use for overhead lifting, to support- human weight, for playground or athletic- equipment or as a safety device Do not use if visibly worn or distorted T7655312N 1 IN. 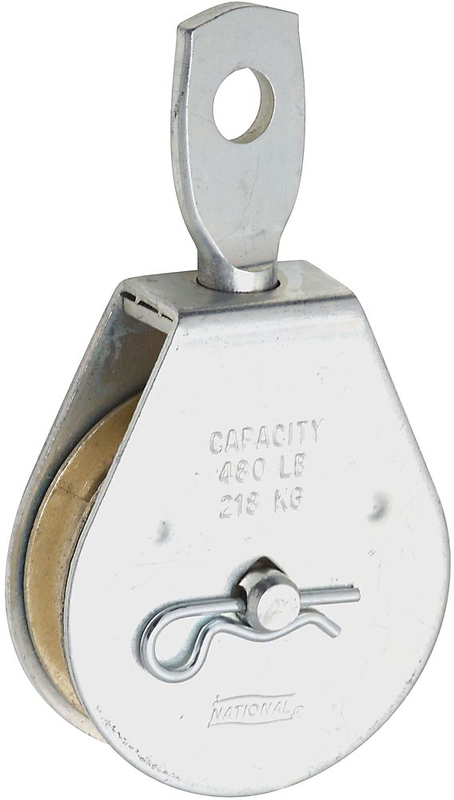 DOUBLE PULLEY SIZE:1"x 5/16" LOAD LIMIT:25 Lb. 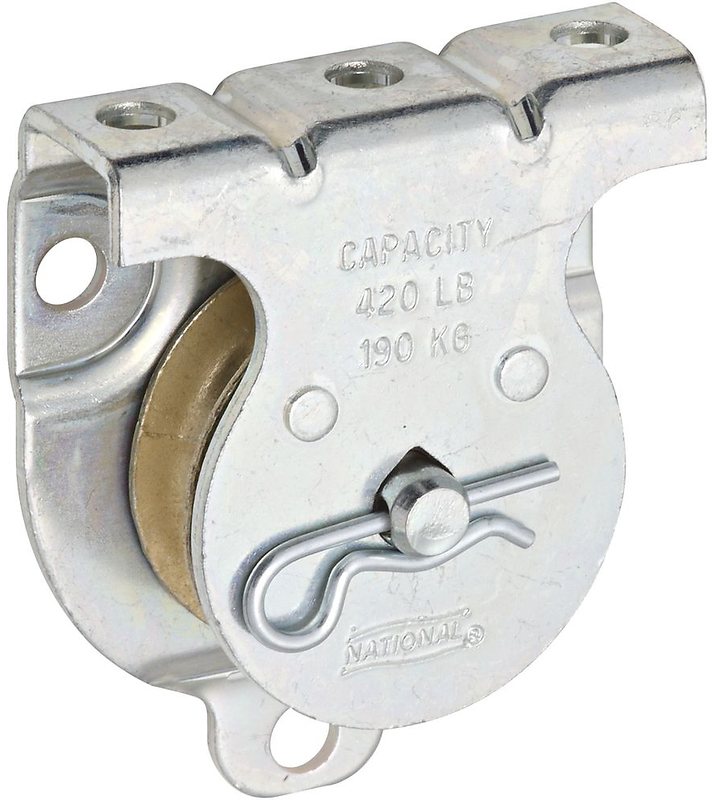 3213BC FIXED EYE SINGLE PULLEYS Removable axle and sheave for easier rigging Swivel eye to eliminate tangling Use w/rope-cord for indoor/outdoor applications Steel body & axle - Life Lube alloy bearing Zinc die-cast sheave - 3/8" maximum rope size Do not use for overhead lifting, support of- human weight, athletic or playground equipment Zinc plated - boxed loose - barcoded 3213BC 2.5 IN. 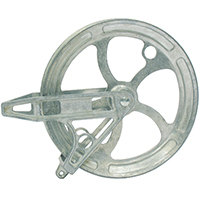 FIXED SGL PULLEY SIZE:2-1/2" CAPACITY:550 Lb. 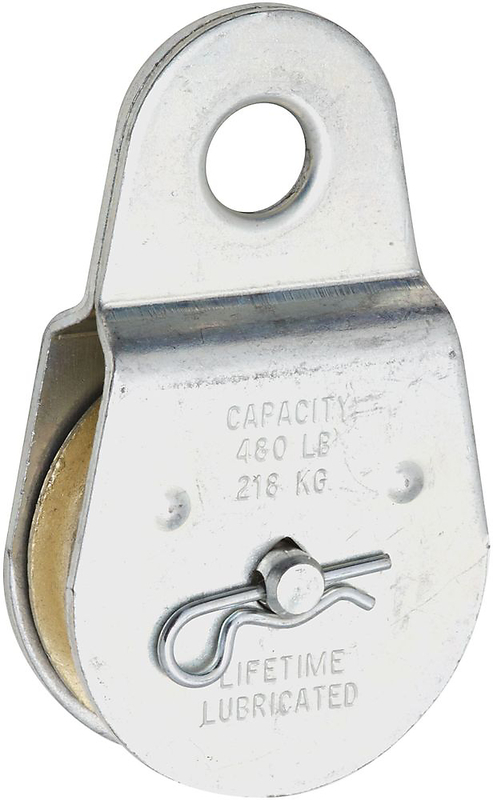 SWLMaximum Rope Size 3/8"
3213BC FIXED EYE SINGLE PULLEYS Removable axle and sheave for easier rigging Swivel eye to eliminate tangling Use w/rope-cord for indoor/outdoor applications Steel body & axle - Life Lube alloy bearing Zinc die-cast sheave - 3/8" maximum rope size Do not use for overhead lifting, support of- human weight, athletic or playground equipment Zinc plated - boxed loose - barcoded 3213BC 1.5 IN. 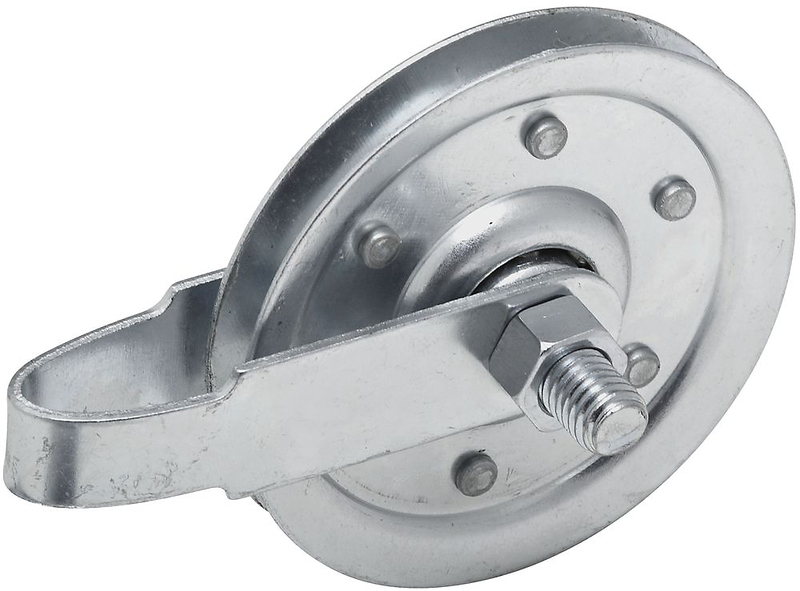 ZP FIXD SGL PULLEY SIZE:1-1/2" CAPACITY:420 Lb. SWLMaximum Rope Size 3/8"
COME-A-LONG Imported - consumer grade 3/16" diameter galvanized aircraft cable Maximum lift 12 ft. Double locking drive pawls Drop-forged steel frame, galvanized against rust Automatic let-down with safety latch CAL-2 2TON MAASDAM COME-A-LONG SIZE:2 Ton CABLE LIFT:6 Ft.
3213BC FIXED EYE SINGLE PULLEYS Removable axle and sheave for easier rigging Swivel eye to eliminate tangling Use w/rope-cord for indoor/outdoor applications Steel body & axle - Life Lube alloy bearing Zinc die-cast sheave - 3/8" maximum rope size Do not use for overhead lifting, support of- human weight, athletic or playground equipment Zinc plated - boxed loose - barcoded 3213BC 2 IN. 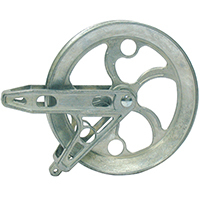 ZP FIXED SGL PULLEY SIZE:2" CAPACITY:480 Lb. 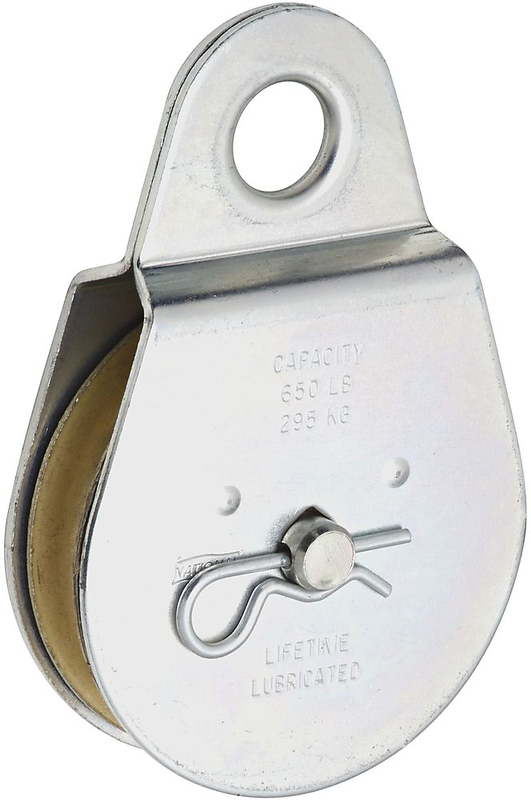 SWLMaximum Rope Size 3/8"
V7633 EXTENSION SPRING PULLEY For residential extension spring doors Galvanized finish 1 pulley per visual pack V7633 3 GALV PULLEY SIZE:3"
3213BC FIXED EYE SINGLE PULLEYS Removable axle and sheave for easier rigging Swivel eye to eliminate tangling Use w/rope-cord for indoor/outdoor applications Steel body & axle - Life Lube alloy bearing Zinc die-cast sheave - 3/8" maximum rope size Do not use for overhead lifting, support of- human weight, athletic or playground equipment Zinc plated - boxed loose - barcoded 3213BC 3 IN. 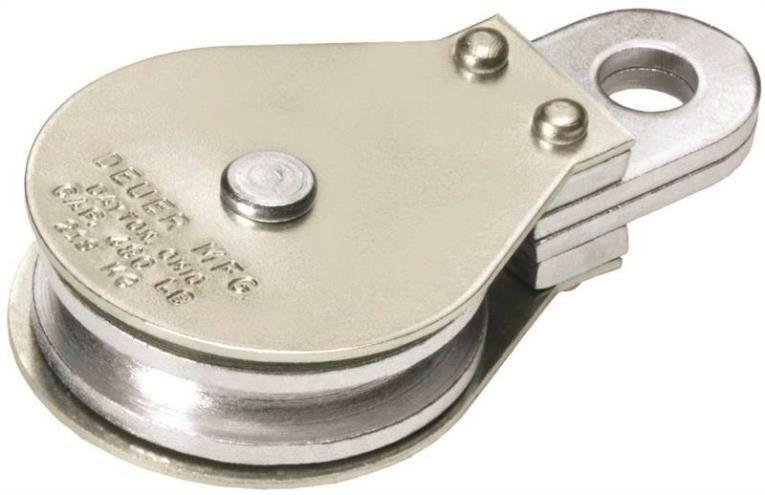 ZP FIXED SGL PULLEY SIZE:3" CAPACITY:650 Lb. 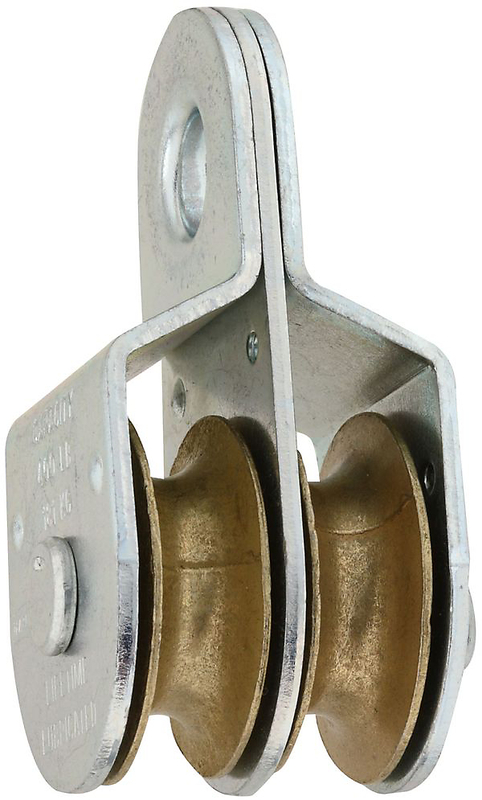 SWLMaximum Rope Size 1/2"
V7634 EXTENSION SPRING PULLEY Galvanized finish For residential extension spring doors Includes fork, axis bolt and nut Visual pack V7634 3 IN. GALV PULLEY SIZE:3"